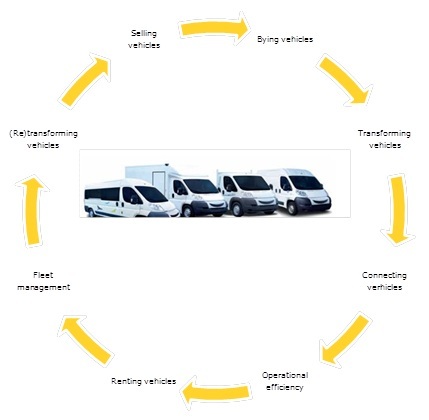 By offering vehicle monitoring services (batteries, oils) as well as tools for profiling of drivers, it was possible not only to optimize fleet management tools and associated maintenance, but also to optimize additional financial costs, e.g. insurance costs for these fleets. Mobile Apps connected to our platform and associated with goods transportation also provide productivity optimization by helping to raise the first delivery attempt success ratio (via geo-fencing features). 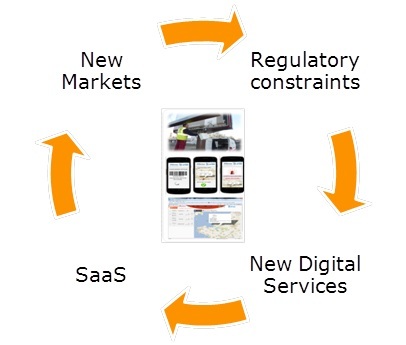 By rethinking the company’s value chain and identifying how IoT and technologies could create new value-added services, it was possible to provide traceability services; and thus enrich the service catalog carriers up to the establishment of different economic models (open real-time services on the fly, pay per use model..), in addition to offering real time sensors measures, such as thermometers, to ensure regulatory compliance. Therefore, creating this capability is a good way to illustrate the principle “Butter your bread on Both Sides” as recommended in the second VINT report on D2D. Visit Sogeti’s website for more information about IoT services. Leading the innovation topic for Sogeti France since 2010, Jacques contributes to install a new way of Innovation Management, pushing a mindset based on demonstrating the innovation added value for Sogeti and our clients as well. The first edition of “Insight on innovation” published in 2010 described briefly and pragmatically this new mindset. More on Jacques. Siguiente Test Automation: Is it about Recording or Engineering?